Another year, another circuit. But already in 2010 I’ve got a feeling this year’s ASP World Tour is going to set the performance bar at a whole new level. The marker has been laid down in the opening event on the Gold Coast. There’s always hype around the first event and this year it definitely lived up to expectations. I’m convinced the level of surfing has definitely lifted again, setting the stage for the rest of the year. Taj and Jordy have thrown down the gauntlet for 2010. Both have definitely stepped up their game and Taj in particular is on a major roll. With him winning Pipe and then at Snapper, followed by his second in the Drug Aware Pro WQS contest in West Oz last week, he is making a huge early season statement with his really fast, powerful and precise surfing. I was pretty happy with my campaign at the Quikky Pro even if I obviously wanted to finish higher than equal fifth. I felt like I surfed well in the event so I am not going to get hung up over losing a tight quarter final to Jordy. It’s a solid start for me and a “keeper” result. If you look at previous world title winners, most didn’t have results too much worse than 5ths along the way so I’m happy to bank that one. The other bonus from the contest was that we got some really good waves too. There hadn’t been much lead-up swell and I thought we were looking at a likely small-wave showdown. So I was pleasantly surprised when a good-sized swell co-operated. 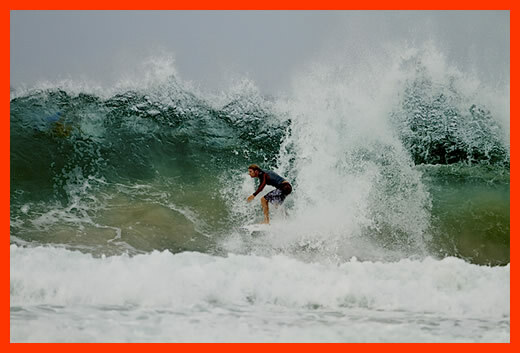 In the third round we got some really nice waves and it was that heat I enjoyed most. The 19.27 score I racked up was the second highest scoring heat of my tour career. I drew my good mate Luke Munro from Currumbin and it was just one of those heats where everything went right for me. I had a perfect rhythm throughout and every time a good set came through I had priority. The conditions were very similar to my highest heat score I’ve had which was when I beat Kelly in the same contest in 2007. The highlight was obviously the 9.97 ride I scored. I knew it was going to be a good one as soon as I saw it coming. I took off kinda late and free fell but it was on the perfect angle and that let me drive straight into it. It was just so hollow through the first section but then it ran off after that and I honestly thought I was gone and it was going to shut me down. But it just shot me out the end of one of the sickest Superbank barrels I’ve had in a while. When I came out I was so happy and I claimed it with the old fist in the air. Just as I did, I thought “Hang on, this wave isn’t over yet’. I got two more turns in but fell on my last move. In hindsight, I should have tried a bit harder to make the last move as it could have secured a 10. But, heck, emotion just took over after the barrel. Ha! I’m just back from Margaret River where Taj got me in the semis of the WA contest. It was fun to get back to Margarets for the first time in about five years. Third place and a fistful of nice overhead rights and lefts made the trip worthwhile. It was a hell final between Josh Kerr and Taj too – one of the best I’ve ever seen. The 10-pointer Josh pulled off late to set up his win was just insane . It was more like a 15 then a 10!And let’s face it, that’s what it took to stop Taj’s winning streak. So it’s off to Bells now. I’ve been going there since I was 15 and I never tire of the place. I didn’t do as well there as I wanted last year so I’m on a mission this time. Fingers crossed, cos I’m looking for a big one. Pipe was pumping for the first two days … The World Title went down and everyone has already seen that so I wanted to show you all a few waves with a little retirement send off to legends Greg Emslie and Phil Macca. I’m on my way to Hawaii, we’ve got an amazing world title showdown about to unfold in front of us at Pipe and my mind is just full of all of those amazing waves we had last North Shore winter. My mood has obviously been helped along by my recent run of results which has got me back into a position to achieve my goal for this year – finishing inside the Top 5. I’ve had a chance to freshen up at home on the Goldie after the Search in Portugal and I’m frothing about what might lie ahead in Oahu. The Triple Crown is going to be awesome. Having that little “mini-circuit” at the end of the Dream Tour is a nice carrot at the end of the season for the guys who are out of the running for the world title — and that’s all of us bar Mick and Joel! That carrot’s pretty big this year too. It’s a nice cash prize but I still reckon the prestige of being a Triple Crown winner is something money can’t buy. If I can repeat my 2007 Crown success again, I’ll be stoked. But most eyes are rightfully going to be on Joel and Mick. 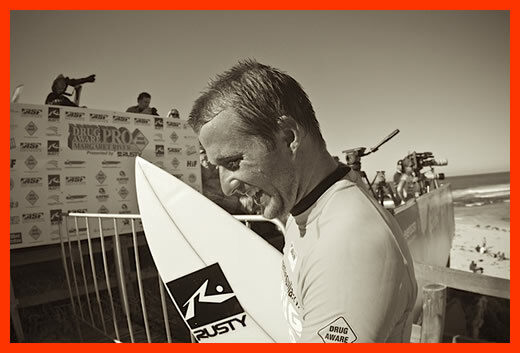 Australia wins either way because we get to bring the world champion home with us at the end of the Pipe Masters. It’s going to be an awesome show as the title comes down to the wire. I’ve done that the last three years running, so the pressure’s on at Pipe! My recent run gives me some confidence, though. I last blogged after the event in France where Mick beat me in the final. I followed that with a 5th at Mundaka and then reaching the final in Portugal against Mick yet again. So I can’t be too bummed. Two seconds in France and Portugal, a third at Trestles and a fifth at Mundaka gave me the consolidating run through California and Europe that I needed. It was a bonus to also be involved in one of the more memorable tour days. I’m talking about the third round and quarter final day at the Search. We’d missed the best surf in years at Mundaka by a week so everybody was amping for Portugal. We had fun waves before the event started. There are so many set-ups there and that coast gets so much swell. Everyone was stoked to be surfing some good waves because we hadn’t had much the rest of the European leg. I felt right at home among the punchy beach breaks. 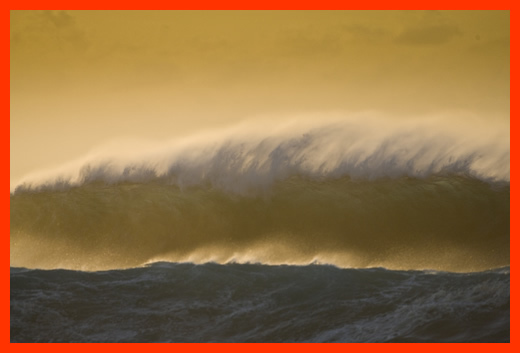 Growing up on Straddie Island, we encounter those sorts of waves all the time. The only bummer is they are board breakers too! I snapped my favourite board on my first wave in my heat with Marlon Lipke. I was so bummed. It was the magic board I won in Brazil last year and that I had used in the final in France. I loved that board! It was hard to get my head around it for a couple of minutes there but then I said to myself: “I’ll get another magic one”, and got on with the heat. The third round and quarter finals were pretty insane. We scored some of the best waves of the year in round three. There were a lot of closeouts in the quarters but the odd perfect one would sneak through. It was one of those that saved me in my quarter with Jordy. That’s a heat I’ll definitely remember. I knew he would be fired up to beat me because I had knocked him out in the last comp the week before. And sure enough he had me on the ropes and just about beat. I needed a 9.67 to win, which is pretty much a 10. But I just had this weird feeling that if I was patient I was going to get it. Luckily this bomb came through and it went to plan. That wave – and being awarded a 10 – was such a rush. And the crowd made it even better. They were insane to surf in front of, probably the best I’ve seen on tour. They made it so much more exciting to surf. My semi clash with Parko is also something I’ll remember for a long time. I knew it was going to take a big heat to overcome Joel given he was obviously back in top form. The swell had dropped off from the previous day but it still looked fun. Joel got a couple of good scores early then the wind changed halfway through the heat and just went to crap. I needed something like a 7.8 and I couldn’t see much hope of that given how the barrels at the start of the heat had pretty much disappeared. Time was ticking down and this left came. Parko didn’t go it and I thought ‘I’ll just go it and see what happens’. It turned into a 7.3 and then I only needed a 5.5. I paddled back out and pretty much got nearly the same score. If only all heats went that well! The conditions were even worse for the final. Mick and I were both scrambling for whatever we could find. It was really hard to find a wave that ran off and let you get in a few turns. I fell on a good wave and that probably cost me the final. But it was still good to finish on a high note after a good trip. Bede checking in from Mundaka. It’s been a hectic few weeks since the tour resumed and we’re right in the thick of the action now in Spain. 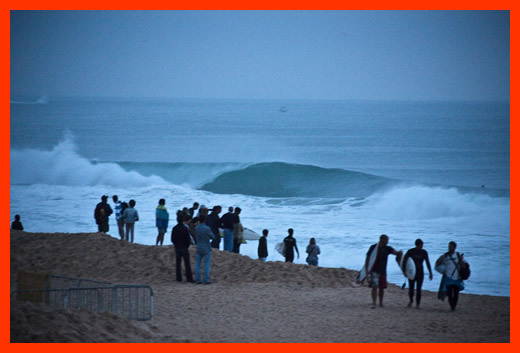 Trestles and the first of the European events in France came right on the top of each other after the long six-week break post J-Bay. is arguably the most critical time of the tour. That’s definitely the case for Mick Fanning and Joel Parkinson. And it has been for me too. I went into Trestles determined to make my own move after being dissatisfied with some of my early season performances. So to come away with a semi-final appearance out of the Hurley Pro and then a second to Mick in France last week was a good feeling that told me I had used my time off since J-Bay wisely. harder if I wanted to stay in the top 5. I’d become a bit slack around training and I wasn’t putting in the same effort as last year, which was why the results weren’t coming. The work I did with Gary and Wayne was also very specific to this up and coming leg of events. Plus I was armed with some pretty good boards which just added to my confidence. Trestles went well from the outset. It’s always been a good venue for me (I won my first WT contest there). It’s like a perfect little wave park and I was really looking forward to getting my year back on track there. I felt I was surfing good and then I ran into Dane Reynolds in the semis. Dane was on fire. He was riding a smaller board and just doing some massive airs, almost at will. With a few huge carves thrown in as well, it was an impressive showing. I felt we had a good heat. I was able to get a couple of airs myself but the difference proved to be one really high score of 9.67 Dane pulled off which included two really nice airs. Equal 3rd place showed me I was on track though, and I immediately felt good for France. It was ironic to come up against Dane again, only in the fourth round this time. I knew it was going to be another tough heat and this time I wanted to get off to a flyer to put Dane under some pressure. I was able to get that quick start and with the waves slowing up as our heat wore on, I was able to hold my lead and get one back on Dane. I felt I surfed really well the whole contest except the final. It got a bit choppier and I didn’t adapt to the conditions as well as Mick. I was trying to push my turns too much and caught the odd rail which cost me. Mick was surfing so precise and fast and the better man won on the day. But Trestles and France did help me climb back up to #4. I’m back where I want to be in the ratings. I want to finish the year off strongly and remain in the top five. Realistically, the world title is a long shot for me this year. But if I can remain in the top five after finishing second last year, I can set myself for a shot at the title next year. Hey everybody, dialling in from South America. I’ve been here in Brazil for a few days now. It’s a real mission for we Australians to get here flight-wise and I wanted to be as adjusted as possible ahead of defending my title here. To a large degree, this year’s Hang Loose Pro is almost a completely different event to the one I won here last season. This year’s event is much earlier in the season, and it’s the middle of winter here now so the water is colder than when we’ve been here in the past. The upside is the locals say this time of the year is a much better swell window, so that’s got me excited. So has the chance to get back into the water with a competition vest on. It’s been a decent break since the last Dream Tour event in Tahiti and a few of us have been eager to get going again. The view is that the world title race is still wide open. Parko got the jump on us early with the two wins on the Gold Coast and at Bells but now there’s a few back-to-back comps and everybody senses the chance to get on a roll and make up some ground. Me included. Tahiti was a frustrating event for me this year. The swell was small and there were long waiting periods as well. It seemed like the event never really got going. I also copped Andy Irons in my opening heat. Billabong had given him a wildcard and as weird as this sounds, I was actually pleased to see Andy back in the water in competitive mode. He’s such a great surfer. I love watching him and the circuit won’t be the same until we see him back next year in full mode chasing the title. The only trouble was his cameo appearance in Tahiti came at my expense! It was a bit strange striking him in my first heat but that’s life. My mood was eased a little by stepping off the plane back into Australia into one of the biggest swells to hit the East Coast in years. It was a bit messy at times but on one memorable day I got towed into some beauties off Currumbin Alley. It was a good 10′ — and that’s pretty rare for the Goldy. We paid a bit of a price for it, though. The beaches on the Gold Coast now are wrecked. It’s the worst erosion I’ve seen since moving to the Coast. There are still no decent banks, Snapper is a huge hole, D’bah has no banks either and pretty much the whole east coast is wiped out in terms of good banks to surf. So, getting on a plane with the Mt Woodgee boys for our long-planned boat trip to the Mentawais was nice and timely! We had a super fun trip, although we were kind of in between swells. The biggest surf we got was only about 4-6′. The guys who rolled in before us apparently scored perfect waves. That included Mick, Jordy and the Red Bull crew. Then about five days after we got home, we heard the biggest swell of the year had come through up there. After starting the year in two rights, it was time to escape and go left for a while. Fiji … The perfect week to go surf lefts and warm up for Tahiti. My Team Manager at Oakley, Ronnie, gave me the short notice call — and who wouldn’t jump on a four-hour flight to surf Cloudbreak and Restaurants for a fun week with no contest singlet? US surf forecast website, Surfline, had a great bunch of crew going for the week and I was lucky to go for the ride. Fun waves all week, up into the 5′ range, was such a cool warm-up before Tahiti. Just surfing with crew really stoked to be out there makes a world of difference. I tagged Ace and Parko on the Saturday changeover and I was like a grommet; up early, surfing, in to eat, back out at another spot, eat again, back out for a late, and then a cold beer to talk about the sessions and cool happenings of the day. I popped over to Namotu to catch up with our good friends Mandy and Scotty, which always involves a few tins. Big shout out to all the new mates I made that week, so cool to surf with you all and set the excitement that was shown in the water. Hopefully these last few days are fun, with some more tubes, and we’ll be sitting around sipping cold Hinanos with a big trophy! Gotta get back to my sixth coffee for the day, it’s getting cold. We must seize this golden opportunity! Besarkada haundi bat eta Maururu por todos los animos. I’m writing this blog in the plane on the way up to Tahiti and right now I’m getting twitchy in my seat. We’ve heard the waves for the trials at Teahupoo have been fun and I’m frothing at the chance to match wits and nerve against that amazing reef break. The plane is full of other pros heading up there and there’s a real buzz within this silver budgie, that’s for sure. For me, I’m pumped as I didn’t do as well as I wanted at Bells in the last event. I’m ranked 9th after the Australian leg of the Dream Tour and my mission is to improve on that from now, starting with the Billabong Pro in Tahiti. Bells at Easter was a bit of a frustrating time for me. The contest was the first to run under the new ASP format of sudden death heats from Day 1 but with the top 16 seeded into the second round. Unfortunately for me, I had a close heat but went down to Adam Robertson in my opening heat. The waves were really fun for it – about four foot – and we were going score for score the whole heat. With about 10 minutes to go, I held the lead and priority and ‘Robbo’ needed an 8.1. A smaller set wave came in and I let it go, thinking he wouldn’t get it. But he did, lit the wave up and nailed an 8.4. That left me needing a 7.9 – but no more sets came through. I felt it was one of those heats were it could have gone either way. Robbo went on to have such an amazing result, finishing second. I knew ahead of the heat that it would be a tough one. Robbo had won the trials and being a local, he has Bells dialled in. Those guys are always dangerous because they have put the time in at that break and know where to sit in the line-up to get the best waves. The upcoming event at Teahupoo is a classic example of a contest where local knowledge and time in the water make the wildcards and trials winner huge threats to all the top guys. It was pretty frustrating going out in my first heat at Bells. And, of course, there was no extra round buffer there. I think most surfers weren’t really into the new format, so we might see a lot of the other contest using the old format again. Of course, in Tahiti it will be a case of trying to catch up to the tearaway ratings leader. This time last year it was Kelly Slater. This year it’s ‘Parko’. Joel’s early dominance doesn’t surprise me. He’s definitely on a roll and I think his training has a big part to do with that. I know he is putting so much into every part of his preparation. That’s translating to peak performances at the right time – in this case, the first two contests. Joel has always had so much natural talent. We all regard him as a freak but with all this extra training he is doing it’s showing up big time in his results and he is setting a mean pace! In terms of Kelly, I think he has just been a bit unlucky in both contests. He struck hot rising Aussie surfers in Julian Wilson and Owen Wright. Both were on fire and definitely grabbed the opportunity to surf against Kelly with both hands. Kelly was in perfect form last year and sometimes things just don’t go your way. But he will be pretty fired up to do well in Tahiti and he has probably the best record out of anyone there – so expect a strong campaign to turn his year around. like that in Queensland and most decent barrelling waves are rights. But I did slip in a couple of quick trips to my old stomping grounds of North Straddie where you can find some nice left hand barrels. My recent trip to Lakey Peak was also good for some practice for backhand barrel riding. We got some really fun barrels and in the few days I was there I was able to fine tune my ‘pigdog’. So I made it to Tahiti safely, was a marathon of a trip though, got to love layovers, but arrived safe and sound. But once again, no boards. Apparently they never even left Johannesburg when I flew out. I reckon it means nothing if your bags have platinum frequent flyer cards on them or even those priority stickers they put on with your boarding tags. It just gets a bit irritating when you go to an event earlier to put in some time there and you don’t have your boards to surf … awesome!!!!!! Thanks SAA!!! Thankfully, Ben Dunn has hooked me up with one of his 6’4″s so at least I can get in the water. The other thing is my boards are only getting here Friday, and I arrived in Tahiti last Sunday!!! Anyways, we here now at Papa Teva’s spot, you rent yourself a bed in their house and they feed you three meals a day, kinda like a boarding house on the water. A great family, but they battle to speak the best English so it can be pretty damn funny at times trying to ask them questions or explain things to them. The Trials for the Billabong Pro started today, surf is in like the 6ft range, so I’ve been told, have not made it out to Chopes this morning as we’ve been trying to get the boat started that we use for our runs to the line up. The wind is up already so I’d say be a pretty difficult time out at the famous Teahupoo right now. They say there could be waves for the start of the waiting period but we’ll just have to wait and see, they’re predicting 6-8′ but the wind could be an issue.